.HWF welcomes you to the first and only streaming cam from the state of Texas!! This cam is located in Seagoville, Texas in the John Bunker Sands Wetlands just East of the Dallas area. The nest is located in an unusual place---a huge former electrical power tower!! This will be the fifth year for this cam. For two years the cam lost transmission early in the season but we had much better luck last year. Hopefully we will have great transmission by the cam for season five!! The nest location--on the tower! This pair of eagles began nesting at the Wetland in 2011. They now nest in a non functioning transmission tower sitting up high on a ridge. It gives the eagle’s nest a commanding view of the wetlands and surrounding terrain. A web cam has been installed above the nest to facilitate providing a live feed of the eagles and their nest over the internet. The new cam has many capabilities including zooming, panning, and night vision. It is a solar powered cam so on overcast days the camera’s operation may be affected and it may be temporarily offline. If there is no feed when you visit, try again a little later. You will have better luck on sunny days. The American Bald Eagle, a once endangered species, has found the East Fork Wetland a suitable and inviting habitat for the past several years. 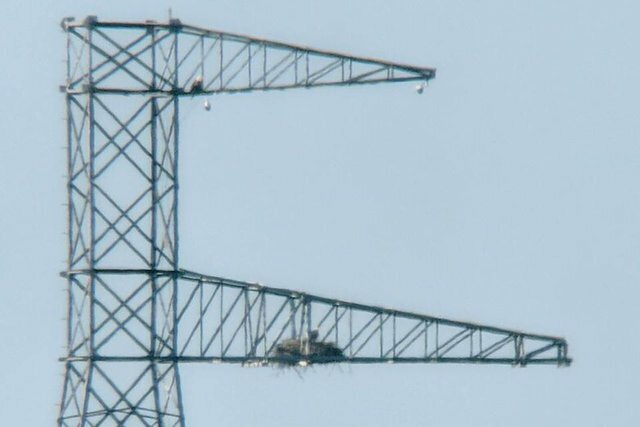 In 2011/2012 a pair of Eagles began building a nest in the outstretched arm of a transmission line tower overlooking the southwestern portion of the wetland. We waited with anticipation for the possibility of eaglets, (young eagles) but they never appeared. Fast forward to winter of 2012/2013 and the pair of Eagles returned, reinforced the nest and were successful in hatching and rearing two Eaglets. Studies in Texas have shown that eagles commonly eat coots, catfish, rough fish, and soft-shell turtles. In Texas, Bald Eagles nest from October to July. Peak egg-laying occurs in December, with hatching primarily in January. When they are on their own, young Bald Eagles migrate northward out of Texas, returning by September or October. * Eggs laid -- Egg#1: December 16, 2018 @ 5:54pm ~~ Egg #2: was laid before 5 p.m. December 19th, 2018. Beauty and tranquility are the theme at the Wetlands. A place to soak in the scenery and wildlife. But not all of the life is 'wild', some is domesticated. Surrounding the Wetlands is a working cattle ranch. These cattle and horses provide a nice backdrop to the marsh reeds and trees surrounding the water. In Texas, Bald Eagles nest from October to July. Nests are constructed primarily by the female, with the male assisting. Peak egg-laying occurs in December, with hatching primarily in January. The female lays a clutch of 1 to 3 eggs, but the usual clutch is 2 eggs. Incubation begins when the first egg is laid and usually lasts 34 to 36 days. The young generally fledge (fly from the nest) in 11 to 12 weeks, but the adults continue to feed them for another 4 to 6 weeks while they learn to hunt. When they are on their own, young Bald Eagles migrate northward out of Texas, returning by September or October. Since 1981, Texas Parks and Wildlife Department has conducted extensive aerial surveys to monitor Bald Eagle nesting activity. The 2003 survey identified 117 active nests which fledged at least 144 young. This compares with only 7 known nest sites in 1971. Fall 2013: The Nest Must Move -- the Wetlands and Oncor had big plans for this nest!! ---(This WAS the plan!) The story of the relocation of the nest from a live tower to one donates by the power company. and operated by Oncor Electric Delivery and supplies over 325,000 volts of electricity to south Dallas. the existing Bald Eagle Nest to a new tower on the Wetland property. and support to this wildlife project. As we all well know--the eagles do things on their time!!! ---AND they did! Winter 2013: Plan A, Plan B…Plan Eagle! a solid design for the new nest tower and an attractive location within 1200 feet of the original nest. To encourage another successful year of eaglets, we decided to postpone any future preparations to relocate the nest until they clear the tower in the spring of 2014. Several visitors and student groups observed the Eagles building up the nest walls a little bit higher and lots of feeding and courtship activity around the nest sight. In the meantime, the Wetland Center and Falcon Steel are working with Oncor’s staff of biologist to monitor the Eagles and ensure a safe relocation effort. This picture shows the relationship between the old nest tower and the new non-functioning one. They are about 1200 feet apart. In July of 2014, after the eagle couple had their eaglets and flew away for the off-season, Oncor painstakingly removed, wrapped up, and relocated their 200-plus pound nest to a new utility pole nearby; one that's not connected to any electric wires. It took a big donation from Falcon Steel and the approval of federal and state regulators, but the enormous effort that cost more than $100,000 was no guarantee. It would still take a wing and a prayer to bring the birds back. The following video highlights the cumulative efforts of Oncor biologists and field employees, the U.S. Fish and Wildlife Service, and the landowner near the John Bunker Sands Wetland Center in Seagoville, TX, to safely and securely relocate a massive nest left behind by a pair of bald eagles and their offspring. 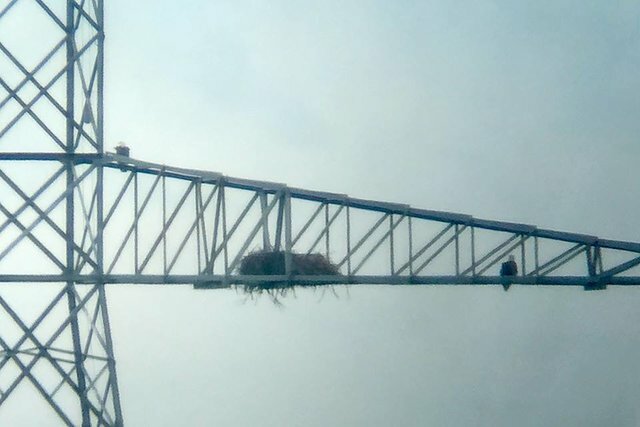 After monitoring the nest perched atop a 345kv transmission tower for more than two years, and following National Bald Eagle management guidelines, the tower cross arm that housed the nest was carefully positioned on a new structure less than a mile away in July. This was to ensure the safety and well-being of the eagles and reliable service to the tens of thousands of customers served by the high voltage line. The new structure was donated by Falcon Steel specifically for the eagle nest. The eagles now have a safe structure away from any electricity and have the ability to nest there for life. Check out the video for an inside look at what the effort was all about. The concern at the time was, that there was about a 50-50 chance they would take to the new site. Much to the delight of all those involved with the project, the eagles returned in October. There was a problem: Instead of adopting their new tower, they gravitated right back to their original functioning tower. Then it just happened--they changed their minds. The majestic birds made the short flight to their old nest on the new tower where they have nested since then! We had a lot of cam problems last season (2018) again that could not be fixed because the eagles were on the tower. Here is a nice photo from JBS showing 10 practicing hard before it's successful fledge on or about June 7th. 12 Oct. 2018 first sightings for the 2018/2019 season. so glad that I decided to check the camera today it was up and both eagles home. 5:27pm I believe mom is in the middle. Last edited by TXmade on Thu Nov 01, 2018 3:45 pm, edited 1 time in total. I too am glad the camera is working so far. Both were on the nest at 5:39 pm, but before I could get my picture capture working right, they both left. FYI: The nest clock is off 13 minutes. One on the nest this morning. A little puzzled as to who as tail not frayed enough to be Mom. FYI: no working camera for a long time. Saw a post that said up by November, but nothing. If anyone knows anything, please post. I do not do Facebook so access is limited. Little early for eggs, but certainly giving nest attention. Around the noon hour, bowl work by Mom. Dad joins with a new stick for placement. Mom clearly in charge. My first view of egg this season. Mom rolled her egg and aerated. Then resumed incubation. By prior posting I am guessing hatch was 12-17-2018. Does anyone know the time? Not absolutely sure, but I think we have two? Got busy and was not checking. I am thinking closer to the 1:00 pm time just by Parent eagle behavior. You have to clock on the 1st pic to actually see better. 1:47 p.m. False alarm. Only one egg. The second egg was laid before 5 p.m. December 19th, 2018. This picture from the webcam this morning shows both eggs while the parents trade places. Thanjs, Ferenz, for keeping us updated on this nest. It is really appreciated! Your scaps are always beautiful. much less that other nests I watch. Hope to see the routine when the eggs hatch.